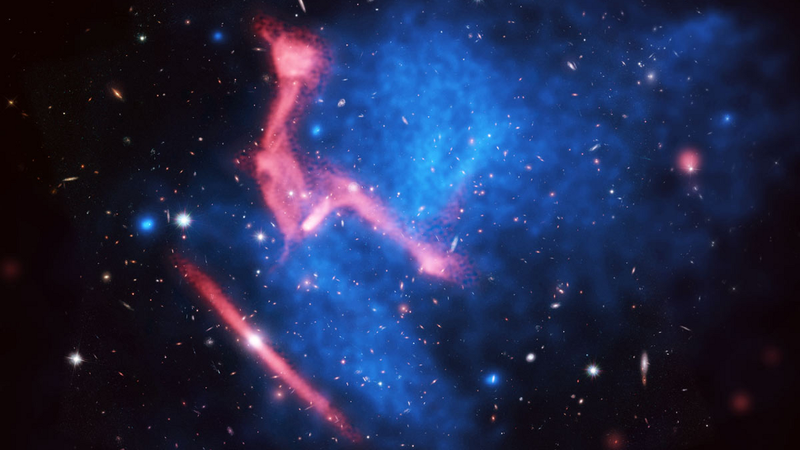 Galaxies often hit each other. But what about galactic clusters? It happens — and this is what it looks like when the largest gravitationally bound objects in the universe slam into one another. This region of space is located about five billion light-years from Earth. It shows no less than four clusters of galaxies in the midst of a rather violent and complex collision. Galactic clusters, which consist of anywhere from hundreds to thousands of galaxies, are known for hot X-ray emitting gas and copious amounts of dark matter. And indeed, this particular collision is triggering a host of phenomena that astronomers are still trying to understand. The image was put together by astronomers using the Karl G. Jansky Very Large Array (VLA) and the Chandra X-Ray Observatory. The picture was combined with an earlier image from NASA's Hubble Space Telescope. The image is so detailed you can make out individual galaxies in the foreground. The Hubble data was used to form the background of the composite image, while the X-ray emission scanned by Chandra is shown in blue. Radio emissions seen by the VLA are in red. The large, oddly-shaped red feature at the center is likely an area where shocks caused by the collisions are accelerating particles that then interact with magnetic fields and emit the radio waves.